SR400 / 500-seat tears of gratitude of Moto Legend Vo.5! ※It may be larger display when you click the photo! 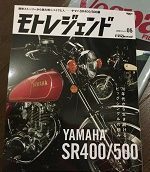 Moto Legend 2016 Vo.05 is but SR400 / 500 Special!? Which magazine also regularly SR400 / 500 feature. … Or was roughly the content is the same I such a case. New custom and of, or follow the trajectory of the SR400 / 500. However! Moto Legend is different! From the beginning of the page, we have to introduce, such as past articles of SR400. It is also a little more detail. Well this is interesting. Since featuring the time of the article, because it describes the SR400 / 500 in the eyes of that era, as well, such as the difference of values pointed out in this article, it has become a very interesting content. Here I thought that if the rest of the magazine a little different. Delve condition is quite deep. And talk is not going to more and more deep part, SR400 / 500 birth secret story of. This is pretty important. Perhaps you think that it is part of Wabi of this magazine, A Mello B melody. So I think that should read firmly. In short, about the birth secret story of SR400 / 500, it means that in addition to the media suggests that there was a little misunderstanding. SR400 / 500 world God advent of! is the emergence of a is Hidehiko Shima teacher father! creator of "load bomber" that triggered the appearance of SR400 / 500! It is loaded bomber IX and load Bomber IX breaks. it has been written in detail. For this book it was not considered an article that describes in detail. has become a thing where you can enjoy even in those who do not. Please be read with pleasure by all means. ● not in the other journals, past articles with a pot SR400 / 500. Such as an error between the actual measurement of the speedometer list covers quite a maniac at the time material. ● SR400 / 500 appeared untold story of. In fact, it is what it can be seen that the spread is a little misunderstanding. ● The most dominating load Bomber. I think I enjoyed understandable when read in conjunction with the “science of motorcycle” in the Hidehiko Shima teacher book. ● current figure of Hidehiko Shima teacher. This is It is valuable, is also noted for the current initiative. This we would like to come published as a book. San’eishobo’s or, Kodansha’s by all means! ! Because in this way has become a dying contents to mania, I have read and try!